It's deserved. Bear is tedious, Bear is annoying, Bear is provocative, but Bear is also fun. Don't take on. I admire Bear but probably not in the ways he really wants. Apart from anything, Bear is OK.
Do you believe we can make a beneficial change to our world? I am honestly curious. 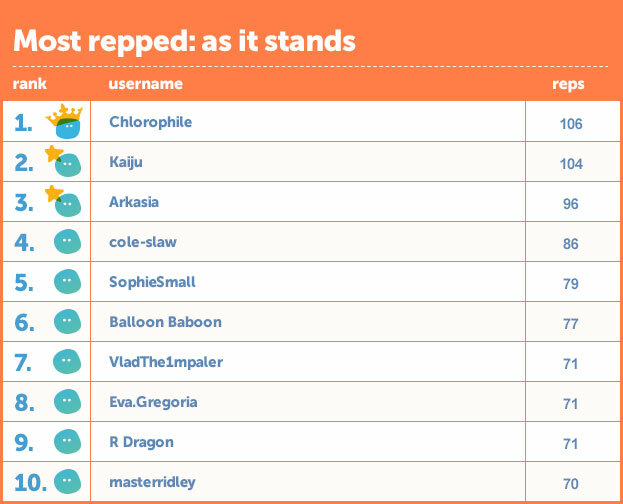 Woow I am joint 12th, my PHD in cake baking and interpretive dance really helped. Posts past the first page tend to be recycling information from previous posts. We get that it's likely disproportionate; there are genuine reasons though. I'm 26th! How is that possible? How can you check which place you're in? Time for another update...here's the rep table from first thing this morning. Quick reminder: this shows the number of times a member's posts have been repped in November so far. At the end of the month, the top-ranked member on the table will have all their rep points from November doubled! This makes no sense. You're ranking members by the discrete number of reps they have - because that apparently is the best way to count things - but as a "prize", you're doubling the number of rep points. Climbing higher up the wall of shame. I really need to get out more. I'll update the top 50 twice a week - so if you've made it into the chart you'll get quoted in by me. The angry rabble will not stop shouting unless you only acknowledge their superiority in university advice rep. Perhaps offering double-rep for any posts helping Oxbridge candidates will appease these elite few? Ooh...it's tight at the top. Just two reps between our top two, Chlorophile and Kaiju, and lots of other people well-placed to catch them up. Did you make the top 50? Next update coming on Tuesday. Sophie has over taken me within a week!